At the base our the food web is the seed. Today’s agricultural seed is increasingly being produced with genetic modification. GMO’s or genetically modified organisms include plants as well as animals. These plants and animals enter the food chain as GMF’s or genetically modified foods. Do you ever stop to consider the impacts of transgenic seed, which is primarily used to grow corn, soybean, rice and cotton. Plant stock is altered genetically by one of two methods. The first method uses agrobacterium, a gram-negative bacterium that produces tumors on plant roots. The tumors contain modified T-DNA which is extracted and used to grow new plants. 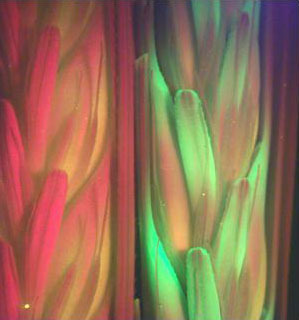 The second method uses a gene gun to infuse plant cells in a petri dish with trait DNA coated tungsten particles. Most of the plant cells die but the ones that survive incorporate the modified genetic traits. These cells are then grown into plants and produce GM seeds. The first genetically modified food was a tomato that was altered to ripen without spoiling and produced a longer shelf life. This tomato was marked as a genetically modified food and was rejected by consumers; it has since been removed from stores. It was then reissued and is sold as unmarked GMF tomato paste. The United States is by far the largest producer of GM crops; other countries include Argentina, Brazil, China, Canada, India and Paraguay. The issue of genetic modification has caused much controversy globally both in public and political areas. Lets looks at who produces and who benefits from transgenic seeds, global acceptance, and some opinions of those opposed the genetic modification of food crops. Monsanto Corporation is the world’s largest producer of genetically modified seeds. 1. Monsanto holds exclusive patent for one form of gene modification known as the roundup ready seed. 2. Roundup ready seed is modified to be resistant to the herbicide glyphosate, which is used in roundup total vegetation kill herbicide. 3. Monsanto holds patent and produces the herbicide roundup. 4. Monsanto combines herbicide resistance gene traits with insect resistance traits in seed production. 5. Farmers purchase the GM seed and then purchase roundup spray herbicide to total kill all other vegetation. Proponents of GM crops claim. 1. GM crops produce higher yields than non-modified crops. 2. Fewer pesticides are required to spray on insect resistance crops. 3. Developing countries will benefit from disease resistant crops. 4. Crops can be engineered to combat climate change. The opposition to GM crops has been varied both in geographic acceptance and in its impact on traditional farming. Some countries have banned the use of GM seeds altogether while others have refused food products grown with the seeds. It is estimated that in the U.S. 90% of soybeans and 60% to 80% of all corn grown is from GM seed. These two crops are used in most of the everyday processed foods that consumers purchase. An example is corn syrup that is used in everything from barbeque sauce to soft drinks. Although processed food contain ingredients that are from GM crops, the products do not require to be marked in the U.S.
As a result of vast U.S. exports of GM seed and food products importing countries have initiated responses that include. 1. Required separation of GM ingredients at the production level with GMF labeling. 2. Cutting off UN World Food program supplies and inducing famine. 3. Total GM crop failures in some developing countries. 4. Interruptions of American exports due to unauthorized gene traits. 5. Moratoriums on harvesting of GM crops due to public demands. Environmental groups and other opponents of GM Seed claims include. 2. Excessive roundup herbicide is sprayed and runoff damages surrounding eco systems. 3. Development of herbicide resistant weeds will create “superweeds”. 4. Long term health effects to consumers ingesting trace herbicides. 5. Insect pests developing resistance to GM modified crops creating “Monster Bugs”. 6. Genetic modified Corn Syrup is used in a majority of processed foods. The future outlook for the use of transgenic seed seems unstoppable. The U.S. is expanding its use into other produce crops, while other countries are being forced to accept GM crops in order to compete in the global food market. As the world population continues to grow and more food is required we may have little choice other than to accept food that is designed in a laboratory. Morton Thompson’s Photoplay article “Exposing Hollywood’s Red Menace” begins by outlining two scenarios of exploitation used by communists to infiltrate Hollywood. In the first example, Thompson tells of a group of prominent stars that gather in the company of Ernest Hemmingway and learn of the suffering in the human condition that is occurring as a result of a lack of ambulances in war torn Spain. The stars are moved to provide financial assistance to aid the cause; unwittingly they are providing funds to a communist cause. Secondly, a famous actor is coerced by fellow thespians, under the spell of communist party, to financially contribute to certain communist anti-fascist organizations. The sense of patriotic duty and charitable contributions to thwart Mussolini and Hitler comes unraveled once Stalin signs a pact with Hitler. The Stars in both scenarios are now guilty of aiding the enemy and the Red Menace financially exploits them by extortion under threat of exposing their party involvement. If the stars resisted then other pledges would work to destroy their reputations from within the studio system. This sets the stage for the significance of the article in outlining the operations of the communist party in Hollywood between 1936 and the publication date of March 1940. Thompson cites a figure of more than two million dollars being provided to communist front organizations from Hollywood pledges during this period. 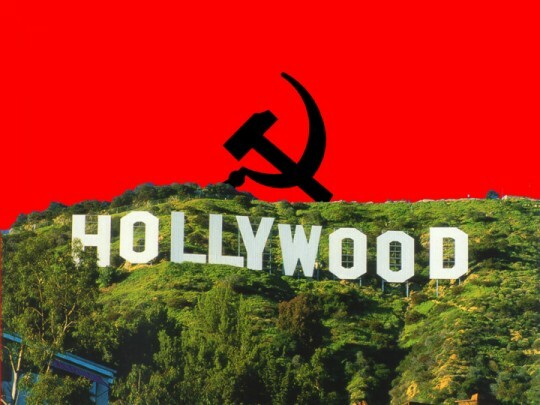 While the financial fleecing of individuals was proving profitable it was the larger potential of media control and manipulation that the communist thrust into the film entertainment industry. The article explains how the goal of insertion of small scenes that had “significant” communist overtones could affect the movie going masses. Thompson states: “That little by little, picture after picture, the propaganda effect will build up until they are ready to make their move. And that move is revolution.” (p.78) The grand conspiracy posed a very real threat to a nation that was weakened from the great depression and seeking a new direction in its advancement. Once the law enforcement began its investigation the Red Menace being built on lies and deceit became its own worst enemy. The informers soon began informing on one another as the communist house of cards collapsed on itself. Easy Pickings. The Hollywood "Extra"
Morton Thompson’s Photoplay article Hollywood’s “Extra Racket” explores the shakedown of extra casting members by organized crime in Hollywood. The detective magazine style story begins with the murder of one Hymie Miller. As Thompson describes it “There was the roar of the gun. And that was the end of Hymie Miller. Chalk up one murder.” Hymie Miller is described as a former player in protection racketeering of would be stars known as Extra talent. This event led to the investigation of a practice that had long been ignored within Hollywood talent industry. Despite its dramatic flair of murder mystery writing style this article provides significant insight to industry practices surrounding the position and vulnerability of the Extra talent pool. Thompson explains that talent had to first join the Screen Actors Guild in order to be hired by Central Casting for low paying background roles. Central Casting would draw from a pool of 9,849 Extra workers. 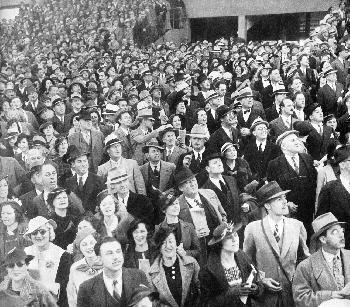 These workers are described as “the lowest rung on Hollywood’s ladder of talent” or “an anonymous part of a mob” and “chunks of human background”. The average earnings for such workers which ranged only from $558 to $317 may not appear significant on an individual basis; however, the combined total paid for extras by studios is reported as $3,124,671. Such a vast amount being distributed on a regular basis to listed recipients provided the crime syndicate with an opportunity for protectionism racketeering. A nickel here, a nickel there, it all added up in the seedy world of 1930’s Hollywood’s organized crime. The tactic as outlined in Thompson’s story was to spread fear through the ranks by offering protection from beatings to the face and body that would prevent an extra from being able to work. To prove their point, a couple dozen extras were randomly selected and badly beaten as an example of what could happen to any that refused to pay their monthly protection dues. Occasionally, female extras were forced to pay with immoral acts in lieu of cash deposits. In an effort to stem the corruption, the Screen Actors Guild hired an independent team of investigators. These former G-Men of the FBI were known as the Atherton Team and set about to investigate the practices of men like Hymie Miller as well as purported indiscretions by Casting Central of favoritism or exploitation of extras. The article ends with a declaration that the Atherton Report is almost complete and will root out the evil. This years nominees in the category of most beaten and extorted extras are….